Hitler and the unwanted gift. 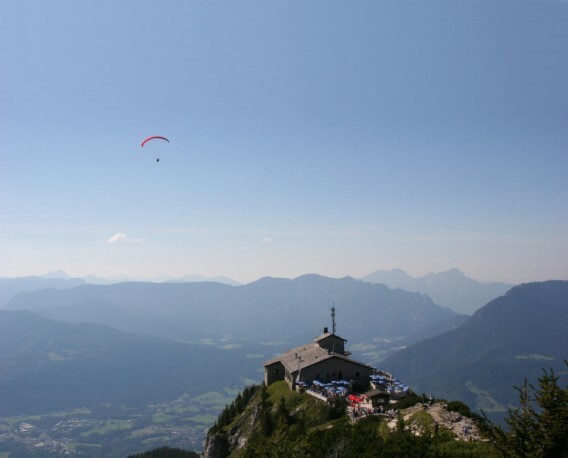 The ‘Eagle’s nest’ – Hitler’s tea-house perched on top of the Kehlstein mountain. I was recently on a research trip to Germany and took a few hours out to visit the ‘Eagle’s nest’ – the tea house built on the top of the Kehlstein mountain overlooking Berchtesgaden in Southern Bavaria. Hitler loved this area and built his own home – the Berghof – lower down on the slopes of the Obersalzberg. Martin Bormann, Hitler’s slavish, self-serving secretary, conceived the tea-house as a 50th birthday present for his Boss. And, without question, considerable engineering challenges had to be overcome in its construction. A road had to be cut alongside the steep slopes of the Kehlstein and, just below the tea-house, a tunnel was dug into the mountain and a lift constructed to take guests up the final few metres. The tea-house was finished, ahead of schedule, in 1938 and then handed over to Hitler on his 50th birthday on 20 April 1939. Bormann often visited his creation atop the Kehlstein – as did Hitler’s girl friend Eva Braun and Joseph Goebbels, the Nazi propaganda minister. But what was a bit of an embarassment for Bormann was that the one person he wanted to impress – Adolf Hitler – didn’t seem to want to use the place at all. In fact, he visited the tea house only about a dozen times and never stayed for long. The ‘Kehlsteinhaus’, the tea house atop the Kehlstein (or the ‘Eagle’s nest’ as we know it in the English language) is thus a prime example of the difficulty of buying presents for a dictator. What do you give a megalomanic tyrant who already can have pretty much anything he wants? Bormann’s mistake was in extrapolating out from a few particulars a general view about Hitler’s personality. Yes, Hitler liked the mountains, yes, he liked taking tea, but that didn’t mean he would like a tea-house on top of an Alp. Hitler’s affection for the Obersalzberg was actually a sign of his deeply provincial and bourgeois taste. Lots of people like walking in the mountains and taking tea – but they don’t want a wacko building like the Kehlsteinhaus which you can only reach by car and lift and makes you feel a bit weird when you are in it. Then, I got to thinking when I was in the Kehlsteinhaus myself, this place is somehow too conventionally megalomanical for Hitler. He would have seen it as too obvious a statement of power – a bit too ‘Mad King Ludwig’ of Bavaria. And – ultimately – Hitler was much, much stranger and less predictable than that. There is a lot of truth in that. No WW1 no WW2 is correct. The consequences of that so called ‘modern’ war starting in 1914 remain with us to this very day – the loss of the concept of ‘chivalry’ for one thing, and the fact that now civilians are ‘legitimately’ involved to name but two consequences. I think the way that people around Hitler had this idea that he could be interested in something as normal as a teahouse when he clearly was a thoroughly evil and despicable man. The idea that he is sitting around eating cucumber sandwiches whilst his deputies are organizing the murder of millions of innocent Jews makes me sick.